Take a look at pages from an instructional pamphlet issued by the Commonwealth of Massachusetts in 1950 amid the Cold War and fears of an A-bomb attack from the Soviet Union. The cover of the pamphlet. What to do during an A-bomb attack. Page 2 of what to do during an A-bomb attack. 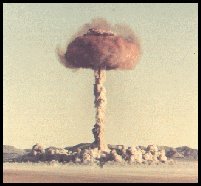 Three ways an A-bomb can hurt you. Page 2 of Three ways an A-bomb can hurt you. Page 3 of Three ways an A-bomb can hurt you.